우리 선조들은 마음을 다스려 몸과 삶을 윤택하게 만들고자하였고, 그 이치를 담은 전통의 향제법을 기록으로 남겼습니다. <동의보감>에서도 향을 통해 마음을 정화하는 문향을 즐겼음을 확인할 수 있는데 설화수는 이 기록을 현대적 감각으로 재해석하여, 그 다섯 가지 향을 제품에 담았습니다. 설화수의 5대 향 중 청아지향은 푸른 숲길을 걷는 듯한 청량한 향기로 마음을 가라앉히고, 백화지향은 매화의 향으로 기분을 맑게 해주며, 윤조지향은 오리엔탈 허브 향을 베이스로 생명의 감각을 일깨웁니다. 홍서지향은 열매의 생기 넘치는 향이 기분을 북돋아주고 마지막으로 흑여지향은 뿌리에 응축된 영양을 담은 향기가 따뜻하고 은은하게 전해집니다. 나무, 꽃, 빛, 열매, 뿌리의 색을 디자인에 담아 다섯 가지 고유 향을 눈으로 먼저 느낄 수 있도록 하였고 청(靑), 백(白), 황(黃), 백(白), 적(赤), 흑(黑)으로 이루어진 한국의 오방색을 연상하게 하여 전통적인 아름다움을 표현하고자 하였습니다. 조화와 균형의 이치를 느낄 수 있는 자연을 닯은 설화수의 5가지 향으로 진정한 홀리스틱 뷰티를 완성합니다. Our ancestors sought peace and prosperity of body and life by controlling the mind and left behind the principle of fragrance through the Record of Fragrance. The ancient book “Donguibogam (Principles and Practice of Eastern Medicine)” records Koreans enjoying the culture of fragrance as a way to purify the mind, and Sulwhasoo reinterpreted the record with modern sensibility and succeeded in capturing the five major fragrances into products. Of the five fragrances by Sulwhasoo, “Cheongajihyang” can soothe the mind with the refreshing scent, as if one is walking through a forest trail; Baekhwajihyang,” a scent inspired by plum flowers, can clear one’s mind. Based on Oriental fragrances, “Yunjojihyang” can awaken one’s vital senses. “Hongseojihyang” can lift one’s mood through the lively scent of ripe fruits. Finally, “Heugyeojihyang” is a warm, elegant fragrance made from the rich concentration of nourishing roots. The design of the Sulwhasoo fragrance embraces the symbolic colors of wood, flower, light, fruit, and root, so that customers can visualize the unique scent. Each fragrance seeks to express traditional beauty, evocative of Korean traditional colors known as “Obangsaek,” or blue, white, yellow, white, red, and black. 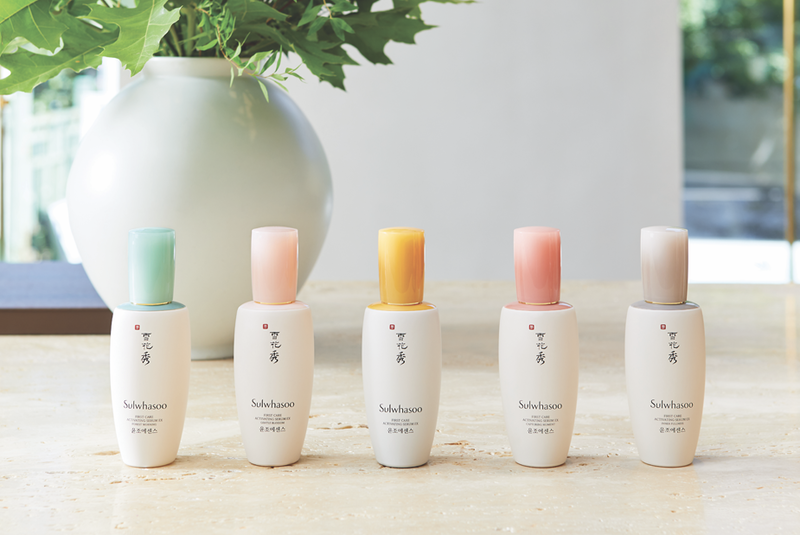 All in all, the five natural fragrances by Sulwhasoo complete authentic holistic beauty through which one can feel the principle of harmony and balance.